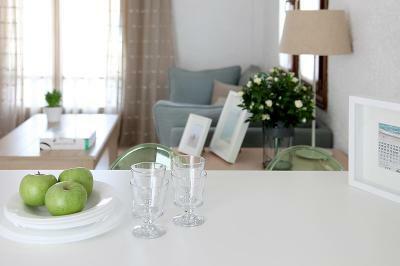 Lock in a great price for Skopelos Village – rated 8.9 by recent guests! 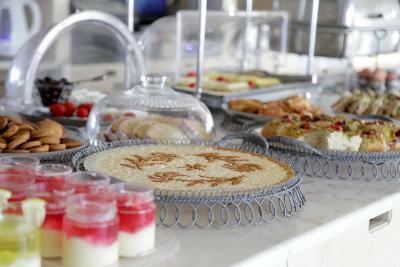 The breakfast was incredible with local specialties, great coffee, incredible setting and views and impeccable service. The resort is everything a stay on a Greek Island should be: beautifully located, comfortable, and staffed with especially courteous people. Breakfasts were delicious. Lovely spacious impeccably clean Sea Breeze Suite with a sea view... good well furnished lounge, comfy bed, and spacious bathroom with shower only tho. Breakfast on a gorgeous terrace was just good, not excellent. Fabulous reception staff. Free parking available, so appreciated. Location and views wonderful tho quite a walk ( 15mins?) to the port and old town. Location and facilities are good. The staff are top class. For example keeping me informed of ferry scedules during some bad weather before we arrived. We booked for 4 days, 3 of which were during Zorba the Medicane. This limited our expectations and activities in booking this holiday. 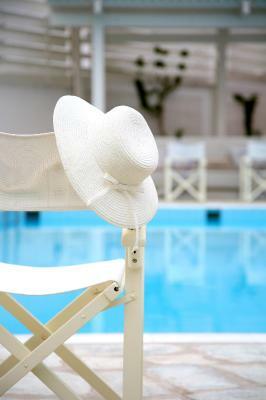 The staff was exemplary in assisting us to the make the most of our holiday despite the trying circumstances. 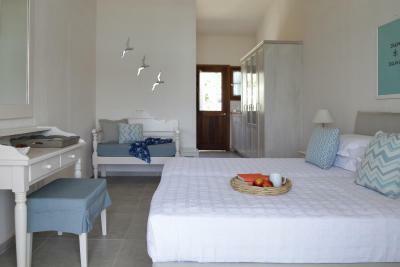 Our accommodation, which was very clean, spacious, with a great view to the sea and with an extremely comfortable bed. The staff, which always so helpful and addressed all of our needs and requests with a smile. The massage at the wellness area was top class. Great location with a short stroll into town. The hotel was very well maintained and very clean. Some members of staff were particularly helpful esp Yiota & Thomas & the night manager, whose name we did not get. We had a ground floor room with a sea view. The room was spacious, comfortable and cleaned to a high standard. We had a spa treatment which was wonderful. The staff were incredibly friendly. 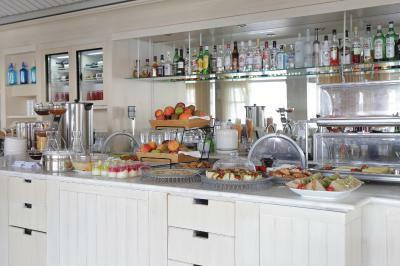 The breakfast provided had a great choice with plenty of fresh juices and other local produce. It was a lovely resort, service that you’d expect from a 5* hotel and as the resort is the most expensive on the island (so we were told) then it met all our expectations. 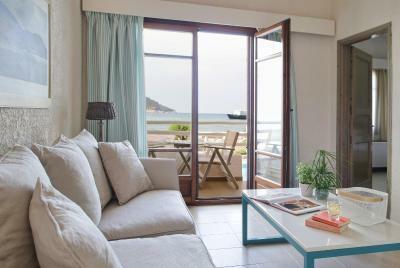 Skopelos Village This rating is a reflection of how the property compares to the industry standard when it comes to price, facilities and services available. It's based on a self-evaluation by the property. Use this rating to help choose your stay! 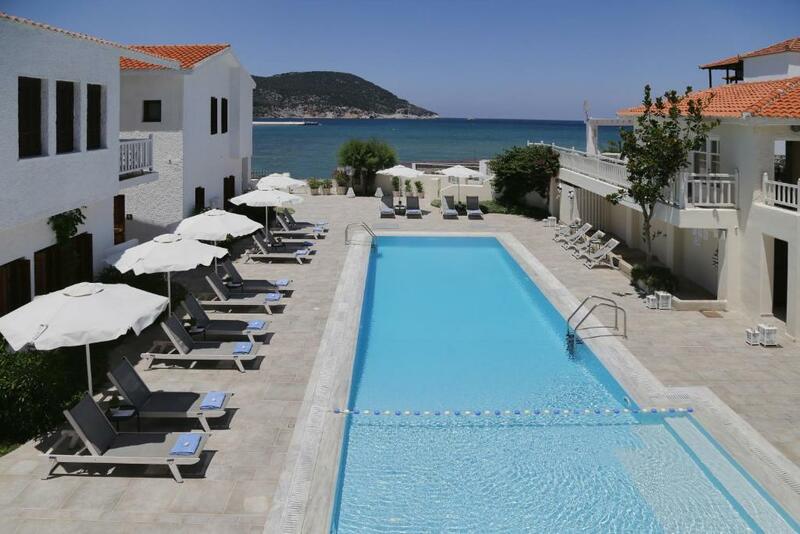 One of our top picks in Skopelos Town.This hotel complex is ideally located in Skopelos, just 1,950 feet from the town center and the harbor. The property features magnificent views over the sea and the picturesque mainland houses. 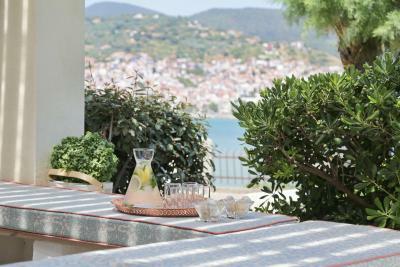 The architecture of Skopelos Village's 35 apartments is characteristic of the Aegean Sea islands, while the inspired interior decoration allows for the relaxation and freshness we seek during carefree summers. 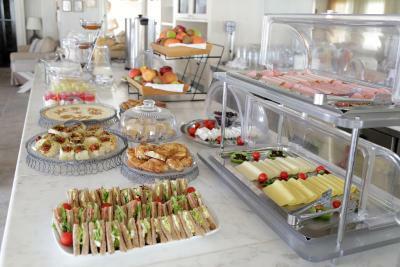 Buffet breakfast is daily served. Skopelos is a paradise where the green of pine trees and dense forest mix with the deep blues of the sea and sky. In fact, Skopelos has been named as the Green and Blue Island by the International Organization of Biopolitics. This is an island for escaping from the pressures of modern life and resting in peaceful, serene surroundings where you set the pace. 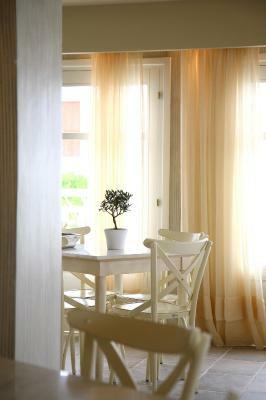 When would you like to stay at Skopelos Village? Decorated in warm colors and local art items, this air-conditioned suite comes with a bedroom, a living room and a bathroom. Offering views of the lush garden, it has a satellite TV and a mini fridge. Please note that this room type can accommodate 2 adults and 1 child up to 11 years old. Please note that the child will be accommodated at a sofa bed in the living room. 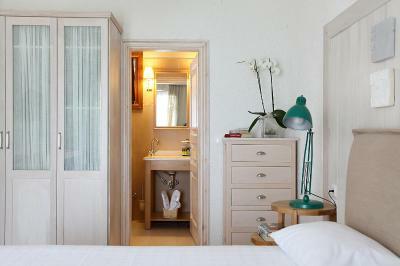 Overlooking the sea, this suite is furnished in warm colors and features 2 bedrooms, living room and bathroom. 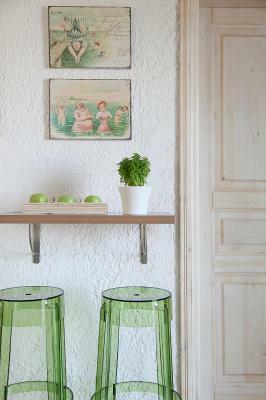 Please note that this room type can accommodate 3 adults and 2 children up to 11 years old. 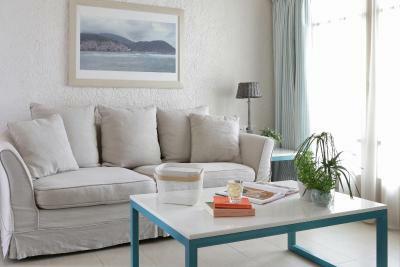 Please note that the 2nd child will be accommodated at a sofa bed in the living room. 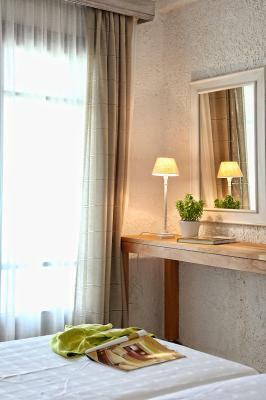 Overlooking the lush gardens, this air-conditioned room comes with a satellite TV and a mini fridge. Decorated with local art items, it has a safety deposit box. Please note that there is no capacity for extra beds in this room type. Maximum occupancy is 2 guests. 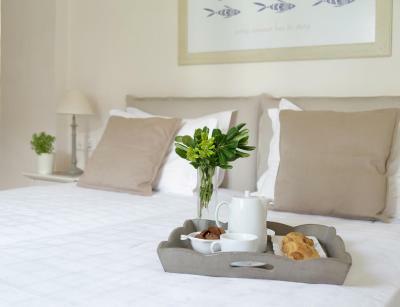 Offering views of the sea, this elegant and stylish suite includes a spacious bedroom and a spacious living room. Overlooking the pool, this air-conditioned room comes with a satellite TV and a mini fridge. Decorated with local art items, it has a safety deposit box. 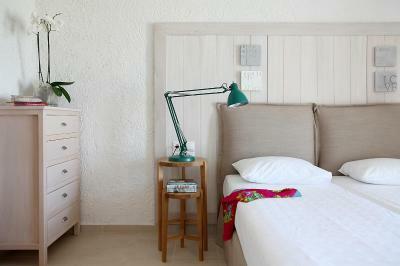 Overlooking the sea, this air-conditioned room comes with a satellite TV and a mini fridge. 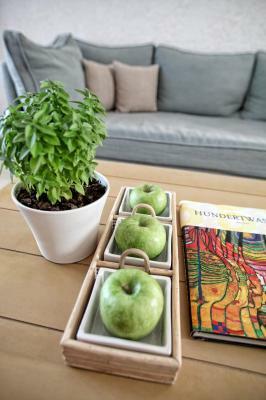 Decorated with local art items, it has a safety deposit box. 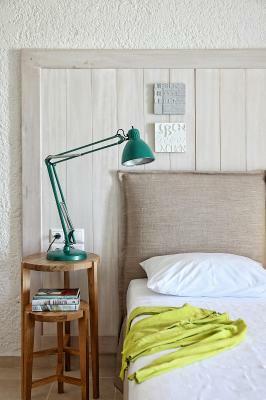 Overlooking the sea, this junior suite is decorated with warm colors and local art items and features a bedroom, living room and bathroom. Decorated in warm colors and local art items, this air-conditioned suite comes with a bedroom, a living room and a bathroom. Offering views of the pool, it has a satellite TV and a mini fridge. Overlooking the pool and the garden, this stylish suite features furniture in warm tones and includes 2 bedrooms, a living room and a bathroom. Please note that the 2nd child will be accommodated at the sofa bed of the living room. For 30 years now, since our grandfather Christos’ time until today, the goal of Skopelos Village has been only one. To provide its guests with high quality services but at the same time never lose the smile and the warmth of a family business. That's why all these years we pursue to establish a personal relationship with the travelers who chose to stay at our hotel. We strive to satisfy their every need with great care and eagerness. 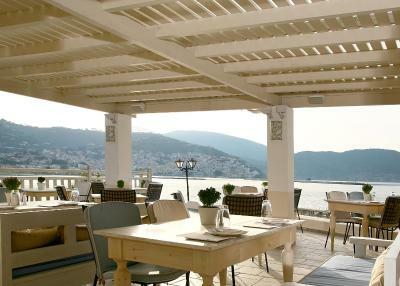 We believe that our visitors are not just customers, but guests visiting our home and the beautiful island of Skopelos. 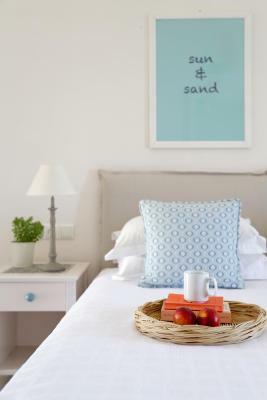 House Rules Skopelos Village takes special requests – add in the next step! Skopelos Village accepts these cards and reserves the right to temporarily hold an amount prior to arrival. 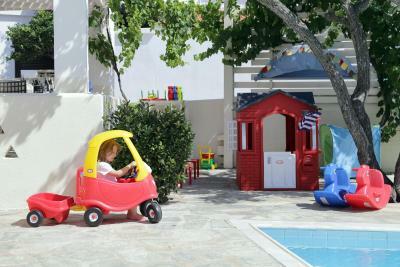 Please inform Skopelos Village in advance if you are traveling with children. You can use the Special Requests box when booking, or contact the property directly with the contact details provided in your confirmation. Please note that children up to 12 years old stay free of charge. For older children or adults, charges will apply. 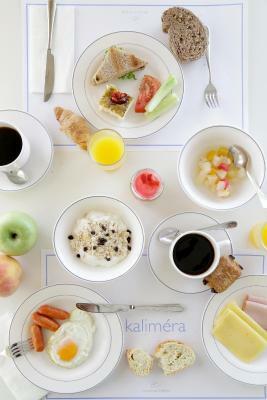 Buffet breakfast with very ordinary selection and offering canned fruit...NO fresh fruit, surprising in a hotel at this level. And there was a charge for a cappuccino with breakfast! Adequate amenities in bathroom tho no face cloths provided. And bathrobes only appeared on 2nd day. Hotel is great. Only criticism is that the restaurant for our dinner at least did not match the superb standard for the rest of the hotel. However we only ate there one night. Keep in mind that decent beaches are at the other side of the island, but there is a shuttle from the hotel. It’s very hard to say anything that we didn’t like but if I was being really picky then I didn’t like the filter coffee served at breakfast but it was made up for by then Nespresso machine in the room! It is too expensive. It could be half price for having good value for money. There are many hotels everywhere with almost the same facilities, that cost 130 - 180euro and not 270. The best hotel we have ever been! Beautiful, clean, friendly staff, good location, small enough (only 35 rooms), very good breakfast, good service, wellness studio, free 15min massage and wine bottle in room were nice extra surprise. Ultra friendly staff; great shower, powerful WiFi; good breakfast; free beach trips; good air conditioning. Oh and great lunches too. This hotel is fantastic, it sits on the edge of the bay a short walk along the seawall to the town of Skopelos but far enough to be quiet. The food is excellent and the staff are great, courteous and attentive without being intrusive. The Junior suite we had was beautifully finished to a standard much higher than we were expecting. The best recommendation I can think of is that we are going back later this year (for longer) ! The property is much older than what it appears on the website. Linens and beds are worn (not good quality). While we were welcomed by a friendly staff member, the person who assisted with our check-out was unfriendly and rude. Great location. Free shuttle from the port. We were offered a delicious traditional almond sweet on arrival. We received an upgrade of our room (I suspect this was due to the fact that the hotel wasn't fully booked as it was nearing the end of the high season). Overpriced for what it was.